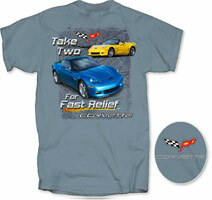 Corvette C6 "Take Two for Fast Relief"
The Grand Sport can be ordered with 1LT, 2LT, 3LT and 4LT trim packages. Other features include the Z06 brake package featuring 14 in (356 mm) front and 13.4 in (340 mm) brakes with 6/4-piston front/rear calipers. Manual models also include a dry sump system from the Z06 and ZR1, and launch control. Behind the blue C6 we have the sleek ¾ front end view of this yellow C6 soft top Corvette. Detailed with those beautiful polished factory five spoke wheels and fat tyres, with attention to the brake calipers, and that unmistakable front end head light assembly finished off with that aggressive front grille facia intake design. Brilliant attention to detail with the light reflections and shadows. The background of the Tee illustrates abrasive texture in dark grey colour and the script “Take Two for Fast Relief” is in bold ‘chromium effect’ font with black shadowing. The C6 Corvette ‘crossed flags’ badge emblem is shown atop of the artwork in true factory colours and detail. The lower script “CORVETTE” is below the main artwork in ‘chromium effect’ font, as per the main script. Tee shirt Colour: Available in Stone blue only, with genuine GM Official Licensed Product Tag.